← This Really Annoys People. Yes it Does. Oh Yes, It Does. 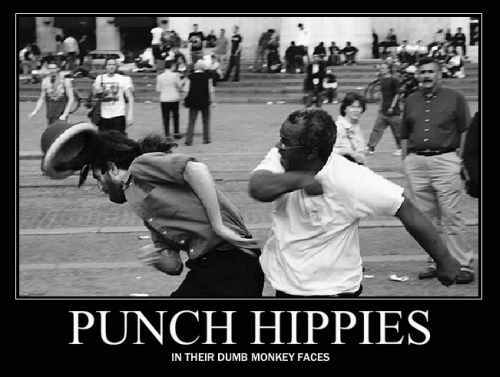 Everbody Do The Hippie Punch! There are many myths within the political blogosphere, but none is so deeply troubling or so highly treasured by mainstream political bloggers than this: that the political blogosphere contains within it the whole range of respectable political opinion, and that once an issue has been thoroughly debated therein, it has had a full and fair hearing. The truth is that almost anything resembling an actual left wing has been systematically written out of the conversation within the political blogosphere, both intentionally and not, while those writing within it congratulate themselves for having answered all left-wing criticism. That the blogosphere is a flagrantly anti-leftist space should be clear to anyone who has paid a remote amount of attention. Who, exactly, represents the left extreme in the establishment blogosphere? You’d likely hear names like Jane Hamsher or Glenn Greenwald. But these examples are instructive. Is Hamsher a socialist? A revolutionary anti-capitalist? In any historical or international context– in the context of a country that once had a robust socialist left, and in a world where there are straightforwardly socialist parties in almost every other democracy– is Hamsher particularly left-wing? Not at all. It’s only because her rhetoric is rather inflamed that she is seen as particularly far to the left. This is what makes this whole discourse/extremism conversation such a failure; there is a meticulous sorting of far right-wing rhetoric from far right-wing politics, but no similar sorting on the left. Hamsher says bad words and is mean in print, so she is a far leftist. That her politics are largely mainstream American liberalism that would have been considered moderate for much of the 20th century is immaterial. Meanwhile, consider Tim Carney and Mark Levin. Levin has outsized, ugly rhetoric. Carney is, by all impressions, a remarkably sweet and friendly guy. But Carney, in an international and historical context, is a reactionary. Those who sort various forms of extremism differentiate Levin and Carney because Levin’s extremism is marked in language, and Carney’s extremism is marked in policy. The distinction matters to bloggy taste makers. Meanwhile, Hamsher’s extremism in language is considered proof positive of extreme left-wing policy platform. No distinction matters; genuinely left-wing politics are forbidden and as such are a piece with angry vitriol. Greenwald, meanwhile, might very well have actually left-wing domestic policy preferences. I honestly have no idea; Greenwald blogs almost exclusively about foreign policy and privacy issues. In other words, his voice is permitted into the range of the respectable (when it is permitted at all; ask Joe Klein if Greenwald belongs at the adult table) exactly to the degree that it tracks with libertarian ideology. Someone whose domestic policy might (but might not) represent a coherent left-wing policy platform has entrance into the broader conversation precisely because that domestic policy preference remains unspoken. I hardly even need to explain the example of Markos Moulitsas. Moulitsas is a blogging pioneer and one with a large audience. But within the establishmentarian blogosphere, the professional blogosphere of magazines, think tanks, and the DC media establishment, he amounts to an exiled figure. See how many times supposedly leftist bloggers within this establishment approvingly quote Moulitsas, compared to those who approvingly quote, say, Will Wilkinson, Ross Douthat, or John Cole. Do some of these bloggers have legitimate beef with Kos? Sure. But the fact that his blog is a no-go zone for so many publications, while bad behavior from those of different ideological persuasions is permitted, ensures that the effects of this will be asymmetrical. I believe that people have to create positive change by changing their own behavior, but I also am aware that the nominal left capitulates to demands that they know the right absolutely will not capitulate to themselves. And so the right wins, again and again. No, the nominal left of the blogosphere is almost exclusively neoliberal. Ask for a prominent left-wing blogger and people are likely to respond with the names of Matt Yglesias, Jon Chait, Kevin Drum…. Each of them, as I understand it, believe in the general paternalistic neoliberal policy platform, where labor rights are undercut everywhere for the creation of economic growth (that 21st century deity), and then, if things go to plan, wealth is redistributed from the top to those whose earnings and quality of life have been devastated by the attack on labor. That there are deep and cogent criticisms of the analytic, moral, and predictive elements of neoliberalism is an argument for another day. That those criticisms exist, and that they emanate from a genuine left-wing position, is a point I find perfectly banal but largely undiscussed in political blogs. And that’s the problem. Whatever those bloggers are, they are not left-wing, and the fact that they are the best people can generally come up with is indicative of the great imbalance. I don’t really know what it means to criticize a writer for holding that his own views are “the truth of man.” Obviously, I agree with my political opinions and disagree with those who disagree with me. If I didn’t agree I’d change my mind. — More redistribution of money from the top to the bottom. — A less paternalistic welfare state that puts more money directly in the hands of the recipients of social services. — Macroeconomic stabilization policy that seriously aims for full employment. — Curb the regulatory privileges of incumbent landowners. — Roll back subsidies implicit in our current automobile/housing-oriented industrial policy. — Break the licensing cartels that deny opportunity to the unskilled. — Much greater equalization of opportunities in K-12 education. — Reduction of the rents assembled by privileged intellectual property owners. — Throughout the public sector, concerted reform aimed at ensuring public services are public services and not jobs programs. — Taxation of polluters (and resource-extractors more generally) rather than current de facto subsidization of resource extraction. Is this a “neoliberal” program? Well, this is one of these terms that was invented by its critics so I hesitate to embrace it though I recognize that the shoe fits to a considerable extent. I’d say it’s liberalism, a view recognizably derived from the thinking of JS Mill and Pigou and Keynes and Maury “Freedom Plus Groceries” Maverick and all the rest. I recognize that many people disagree with this agenda, and that many of those who disagree with it think of themselves as “to the left” of my view. But I simply deny that there are positions that are more genuinely egalitarian than my own. I really and sincerely believe that liberalism is the best way to advance the interests of the underprivileged and to make the world a better place. I offer “further left” people the (unreturned) courtesy of not questioning the sincerity of their belief that they have some better solutions, but I think they’re mistaken. That’s hardly a comprehensive reply to everything DeBoer wrote, but I hope it’s an explanation of what the hell happened to me. I’ll cop to a couple things. First, I’m not a left-winger. I don’t agree with the left about very much. If you’re looking for genuine left-wing thought, this is not the blog for you. Second, I don’t spend a whole lot of time discussing left-wing thought because my interest in ideas is primarily, though not completely, in proportion to their influence on American politics. There’s room for bringing in ideas that have little or no impact at the moment, but I don’t do much of that. One time I did argue with the left was on health care reform, where you had left-wingers making the absurd claim that the Affordable Care Act did not improve the status quo. I found this created an angry reaction and multiple accusations that I was engaged in “hippie punching” or other unfair attacks on the left. So, from my perspective, it seems like left-wingers get upset if I engage with with and upset if I ignore them. Obviously, they wouldn’t be upset if I wrote about their ideas and agreed with them, but on most issues I don’t agree with them. The post discusses the positions of quite a few political bloggers, including Ezra Klein, Matt Yglesias, Mickey Kaus, Jon Chait, Kevin Drum, and the economic, social and career forces that contribute to the rightward pull. And I have to say I understand that part, even thought I do not sympathize. Readers have often said I should be on certain TV shows. And logically, I should be on at least some of them. But guess what, they won’t have me (not even Democracy Now, but that’s because they are not that interested in finance, and when they do that type of story, they seem to prefer either Real People or academics). Even though a TV veteran says it has a lot to do with bookers (they are pretty much all female and he insists they prefer to book men), I suspect another big reason is my outspoken views. One ought to think that would make me a useful guest, since good talking heads TV often involves friction between participants with diverging views. But some types of divergence appear not to be terribly welcome. Now, I agree that a real left-wing – socialists, serious advocates of unionization, etc. – is not terribly well represented at least in the corners of the blogosphere that I haunt. I don’t believe, however, that this is simply due to some larger, concerted effort to ignore and marginalize the left. First, I think that the left-wing as Freddie wants it to exist represents a very small demographic in this country. It is not surprising, then, that it is less represented in public debate and online. Second and much more to the point, I’ve seen Freddie make this complaint before – that his arguments and positions were being written out of debate. This makes no sense to me. When we started The League, Freddie was by far the most linked-to among us. Even now that he no longer (or very rarely) blogs, his posts tend to generate links all over the place. Hell, it wasn’t long ago he got a link at The Dish for a comment he made on someone else’s blog post. This is because Freddie is a tremendous writer, and people find his arguments and ideas – and the way he presents them – compelling and interesting. He’s fun to read. And he gets all these links and responses and discussion in spite of the fact that he is a died in the wool leftist. Indeed, so far as I can tell the greatest threat to Freddie’s ideas receiving no exposure by Very Serious People is Freddie deBoer himself. By removing himself from the debate he has contributed vastly to his own complaint. Because Freddie was getting his ideas out there and then he stopped. Maybe he was frustrated because his ideas weren’t spreading into the liberal blogosphere the way they were getting attention on many conservative and libertarian blogs. That’s fair – it certainly can be frustrating to feel as though you aren’t being taken seriously by the people who matter most. I guess I’d just suggest patience. Actually patience might not be enough – Freddie should organize. If organized labor in this country is withering it isn’t for lack of money or political influence, it is because those who advocate for its survival are not organizing for its survival. In the age of the internet there is no reason people like Freddie aren’t creating their own publications to push their ideas to the surface. Freddie could do it, and he should. It would be far more beneficial to his cause then posts lamenting the decline of the left-wing in America. The barrier to entry for ideas is lower than it has ever been – but those last hurdles – the Washington establishment; the Very Serious People and institutional bloggers and so forth – they can be hard to leap, no doubt about it. But I don’t think Freddie is right to stop trying. Can anyone deny that Glenn Greenwald will never get a gig at Cato or Reason, that Digby and Matt Taibbi will never get gigs at the Atlantic (I consider GG a libertarian)? Can anyone deny that Glenn Greenwald would generate more pageviews than anyone who is at Reason or Cato, that Digby or Matt Taibbi would get more pageviews than anyone but Sully at the Atlantic? Of course, the first rule of establishment corporate journalism is that you do not call it establishment corporate journalism. ED (for example) would like to earn living as a journalist, so it’s natural that he pooh-poohs Freddie’s point. I don’t mean to single ED out; to the contrary, the fact that he takes deBoer’s point seriously at all puts him miles above Joe Klein and James Fallows and the rest, who will always simply ignore these sorts of arguments. They may not even know that these arguments are valid. After all, it’s hard to make a man understand something when his livelihood depends on him not understanding it. 3. One thing I’ve noticed that separates the people Freddie disapproves of from everyone else is that the ones Freddie disapproves of are primarily journalists. Journalists of policy, of ideological movements and changes, and of institutional day-to-day fighting, but liberal people whose primary career training and arc are one of journalism. A journalistic approach to politics has its strengths and its weaknesses. Its strengths are a solid understanding of the micro elements that move things forward or backwards yard-by-yard. Its weaknesses can be a form of source capture, and a myopia on what is achievable in the short run rather than what moves things in the long run. I don’t think the professionalization of bloggers as reporters has moved them rightward, but it could be argued that it has caused them to focus on the short-term, in part because what the Democrats were trying to be bill-wise required a lot of explanation and in part because journalism requires that. In its worse form, it becomes what Jay Rosen and others call A Church of the Savvy, where access, the art of the possible, and a healthy disdain for broader scope thinking are all privileged. This is less disdain for socialist or left-wing thinking (which is disdained by all kinds of people) but disdain for outsiders, a broader and more worrisome issue than Freddie lets on. 4. It’s important to realize that the right-wing wonks Freddie seems to respect as building a long-term vision are running under different assumptions of what to do. To them, the problem isn’t thinking of a better solution to a problem, it’s arguing why there is no problem. This comes from an explicit goal to view their project as an ideological one, one that comes out of a Banfield critique that social science is necessarily ideological. This, by definition, orientates towards long-term visions of the possible. Freddie might want to engage with a left-modified form of the Banfield critique, one that points out when you have a wonk politics hammer every problem looks like a nail. Aaron Bady noticed this with the wonkosphere’s embrace of DIY U and other producitivity related ‘solutions’ to higher ed (also googling that made me realize I stole the title of this from Aaron, sorry!). If all you know are techniques of neoliberalism, then those are the solutions you’ll naturally gravitate towards. That’s different than where Freddie goes, which is one centered around prestige and access. 5. I’ll gladly defend Ezra and Matt on the charges Freddie throws at them. Their key points they raised early over the past two years – that the Senate would become obstructionist not just at a bill level but in a “running down the clock” manner and that would have major consequences (Ezra), that the GOP would not pay a price for their obstruction as people look at their checkbooks when they vote (both) and that the Federal Reserve is a major battlefield for the recovery and progressives/liberals aren’t ready to move, even intellectually, on how to fight for it (Matt) are all major things that happened from the past two years. Ezra in particular has covered the day-to-day amazingly well with a large quantity of work meant to be accessible to a wide range of readers (I write 2 posts every other day and feel like Charles Dickens), and if Freddie’s real critique is that liberals don’t likes unions Ezra has written a lot about how the Obama administration is overlooking them. The Dish has always tried to remain friendly to outsider voices and distance itself from the Inside the Beltway closed conversation. In that sense, the most glaring lack in Freddie’s post is a list of who exactly we ought to be reading and engaging but aren’t. Isn’t that the obvious solution? If we’re missing worthy far-left blogospheric voices, who are they?